There has been a notable shift in completion dates for taxidermists vying for international hunter dollars the last few years. Now generally 6 month turn around are advertised as the norm by more than a few shops........some big and some small. They all do top work and have solid reputations in the field. Personally I have grown weary of the vague responses of a few other taxidermists I have used and recently shipped several mounts out of state for completion. What a good experience to get stuff done on a timely manner and have some decent communications of progress. Between tanning work for some flat skins and a few mounts, shipping added next to nothing to the bottom line and the actual mounting cost was average or even a touch below what others charge for the same work. Do it again in a heartbeat to get my stuff going. You can wet tan and tumble, but most taxidermists that have quick turn around don't. They do a quicker version of wet tanning that doesn't give you the nice soft leather tan that a good tanning process produces. There are good taxidermists that are very good at wet tanning and do tumble their hides, but there was a trend years ago where some were doing a quick wet process that preserved the hide, yet didn't really give the hide a good "tanning"... they were spitting out mounts in 60 days... and it showed after just a few years. You might be lucky enough to have a good taxidermist that does it the old school professional way. I've had hides tanned that I mounted years later and the hides were just as soft then as when they were finally put on the form... I have seen few wet tanned hides done in house that weren't a shrunken mess if not put on a form immediately... those kind of taxidermists ran rampant for years with a lot of disappointing mounts and disappointed hunters after a few years. Even a good taxidermists work won't hold up with a poorly tanned hide. Remember too... one persons idea of a good mount may be a lot different than another persons... I've seen mounts I wouldn't pay $5 for that the owner thought was spectacular. I suppose if you like the mount and how it turned out that is the only thing that matters. If you're happy with it , I'm happy for you. Yep I have a friend that had a great mount was proud as heck of it, them he got a big 10 pt and won a contest so his mount was free, after he got 10 back (done by a good taxidermist) and put it on the wall he finally saw how bad 1ST mount was. He now keeps them in seperate rooms so they can't be seen together. Its just their work load, and or work ethic.. Some do turkey in fall and deer in spring, and or vise versa.. Im having mine re do an old one along with my 2015 archery buck as well this year, and he said he would do them together, seems like it only takes a few weeks, once he starts the actually mounting process. Im not a taxidermist but its just what i was told..
As an aspiring taxidermist, I find that what you are saying here isn't true. There is a reason why wet tanning has grown in popularityand the top taxidermists in the country use this method. Just google the method and you'll see that it's not an inferiour method. I find the opposite to be true; I've seen several dry tanned mounts lately that have been sitting around for years...a lot of the hair discolors and turns a drab, faded carhartt brown color. It is a fact though that there are a lot of crappy taxidermists out there and you can't cut corners to produce great looking mounts!!! I tend to get a little impatient after about 9 months. Usually I get the mount back in about a year. Rich at Fins to Feathers does great work IMO. So I try not to bust his chops about when it will be done and usually just ask for a rough estimate on time. The quickest I had one done was about 5 months but I had gotten the deer before southern zone opened so I think I was first on the list. It is a work of art and does require a good skillset to get it done properly and the last thing I want to do is rush the guy who is preserving my memories! Be patient once you get it back you can look at it everyday and hopefully relive that precious memory and beauty of that majestic animal! 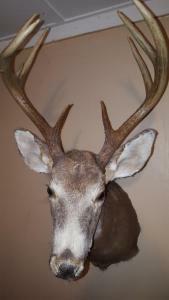 In 2006 i killed this buck, and "A friend" of the family told me he would mount it for me..He Has done side taxidermy for quite some time and all his personal mounts look pretty decent.. So for 200$ he said he would shoulder mount it for me... I was 19 yrs old so i thought sweet... smoking deal.. cant pass this up..
Yea .. not so much.. I waited patiently, gave him his time and along with the horrible work, horrible everything! (but the rack) Every seam is split and separating, it took over 2 years to get it back as well. I did not think it was the same deer when i went to pick it up..
i now know you get what you pay for in taxidermy .. for the most part, i know not in all situations, but Iam quite picky now when it comes to choosing a taxidermist... though someday id like to learn it myself.. I will agree that the wet tanning process today is superior to wet tanning done in the past... I still want mine dry tanned and done by a qualified taxidermist. When it comes to getting a shoulder mount, one way you can get fast, cheap, and good, is if you learn how to do it yourself. Otherwise you will most likely need have to sacrifice at least one of the three. Most of us would choose to sacrifice the "fast", and that is the boat you find yourself in now. 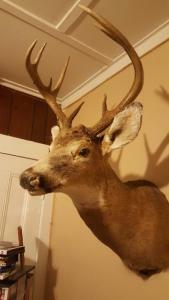 I have had 5 professionally done, by 4 different taxidermists. The guy that did my last one, two years ago, was the fastest at 5 months, with very good quality work, but also the most expensive. The previous guy (retired) did two for me, each taking 11 months to deliver. The quality was a bit lower, but so was the cost. The guy before that (retired) was much cheaper, about the same quality, and took 9 months to deliver. If you have family or a good friend in the business, you might be able to use that connection to get fast, cheap, and good. I was fortunate on my first one with that. My great-uncle, who was a "museum-quality" taxidermist, retired a few years after that. Not everyone has the same "likes" when it comes to judging a mount. Up close, the one my uncle did does not have the "details" of some of the others when it comes to the eyelashes, colors inside the nose, teeth, gums and such. From a distance however, it is the most life-like of any I have seen. He had a real talent for setting the eyes at just the right depth, and the ears at the right angle. That buck almost looks as alive today as he did when he really was, about 30 years ago. Congrats on sending your deer to the taxidermist! The anticipation of the first one mounted is pure agony. But to your question, it's mainly the backlog. That is the case with my taxidermist. My first mount, a turkey, was quoted at a year to get done, he was that far behind. I got it in about 9 months. I've had everything from Schatz's first ground hog to my first buck mounted (pending) and the turn around time is about 9 months to a year regardless of the size or mount. Believe me, your taxidermist would love to get it back to you faster because then you are still excited over it and will pick it up and pay for it. The taxidermists wind up losing a lot of money because of the backlog, people no longer excited over their mounts, got a bigger one and go to some other taxidermist and stiff the first one. My guy has a whole room of mounts people never picked up or no longer wanted. That's the downside of being a taxidermist I guess. So he charges a substantial deposit so he doesn't loose his shirt. Taxidermists and dog groomers are the busiest people I run into. I may combine the two somehow, into a mobile van. Investors?? Possibly you! I'm sorry guys but I did taxidermy full time for over 20 years and went to school for it. Wet tan imo is not inferior. Now if I had a customer who insisted on dry tan Id certainly comply but I did many mounts both ways n you can see no difference either way. Now what I think you may be describing is dry preserved. Basically using a raw hide, fleshed n basically borax soap and preservative is thrown on it than mounted. You can see those mounts everywhere. Ears split, drumming, etc. Either wet or dry tan are great, pros n cons to both. Wet tan stretches much easier, thus fits a manikin easier n fills "voids" in the manikin. But it takes up space in the freezer if not instantly done, turn around as WNY said is a week. Dry tan is gonna get wet once you soak it to remove ear, nose cartilage, turn eyes, etc. can be thrown on a bench for storage n takes slightly longer. Anyone who is telling you its a tannery at fault isn't being honest. Yes it takes time, shipping costs so you can have slower guys trying to fill boxes for a few months before shipping, as WNY said there's prob a bunch of folks in front of you. I've never heard of one guy ever cut a customer off cause he spent less or put say a 15 grand guy in front of him. If your tsxidermist is working n not screwing off Id hope you pick a busy one. I tried to stay under a year but it was tough. Have you got your deer back yet? It's takes long because many on them slack off and procrastinate. 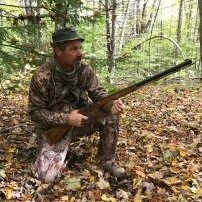 I think a lot of taxidermist wait until the y have enough to send off to the tannery, many do not do it themselves.........so if you drop yours off on opening day, it may sit in his freezer until he has enough to send off, that could be 2 months lost right there. As a full time taxidermist that has been in business since 1985, I will try to clear up some things that have come up in this thread. I personally want every mount that comes through the shop to be finished and paid for as quickly as possible. That being said, I prefer to do all the big game in one block, birds in another block, etc., as they are different processes, and if I ping-ponged back and forth, I would never get anything done. When bears and deer start coming in , they are skinned, eyes,ears, noses turned, fleshed and salted. Then commercially tanned. This usually takes a few months to get back from the tannery. Then the mounting process starts with the first one dropped off, continuing until the last one dropped off. I try to do them in this order with a few exceptions, like if someone needs it back due to illness, special occasion, etc. 1. Customer drop off, write reciept, choose pose. 2. Skin animal, turn ears, lips, eyes, nostrils, flesh and salt. 3. Deliver hides to tannery. 4. Pickup hides from tannery. 5. Match up capes with antlers. Arrange order of mounting, first in, first out. 6. Order appropriate forms,eyes, etc., for weeks worth of heads. 7. Match forms to customers animal as they arrive. 10. finish work: pull pins, fix blemishes, etc. 11. airbrush eyes, nose, etc. 13. Mail completion letter to customer. 1. Customer drop off, choose pose, properly tag waterfowl. 2. skin bird, de-fat, de-grease. 9. Mail completion letter to customer. Keep in mind that customer drop offs/pick ups take time out of the day also, as well as display base work,and getting supplies. There isn't alot of down time in running a taxidermy studio. Besides deer and birds, You also have bears, turkeys, african, exotic, rugs, and fish. There is ALWAYS work being done on SOMETHING..
Keep in mind that if you have a week of deer heads planned, and 3 guys show up at the shop on Monday afternoon after a boar hunt with a bunch of hogs they want mounted, everything else just got bumped. Those animals need to be caped/prepped for the tannery before they spoil. Don't feel bad though, because when you dropped off your archery buck in October, somebody else got bumped so I could prep your critter. 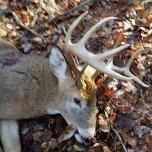 I usually tell my customers that drop off a deer during rifle season that it will be ready over the summer. Then of course there are the problem customers that you have to chase around for weeks/months/years to pickup and pay for thier mounts. The time I wasted on thier mount could have been better spent on yours. Some guys get in over thier head by charging low prices and they get bombarded with work and cannot keep up. These guys usually don't stay in the business long.